​The 12-stage coaching system we use to coach our clients is a brilliant way to get quick and effective results in an results. ​The Ring Technique in Coaching guarantees change for your client. It is simply not possible to complete The Ring and not be a different person. It consists of a series of carefully assembled questions that, when used in a given order and asked in a particular way, enables the client to access all sorts of personal resources previously inaccessible. When you buy this bundle you will get twelve instructional videos; one for each step included in the Ring Coaching™ System. Each video is 12-17 minutes long where Andrew walks you through a comprehensive workbook you use to get effective results with your trainees; in making them understand what is the change they seek on the professional or personal level and how they will lead themselves to make this change happen. This is about identifying the presenting object. ​DASA: Decide what you want. Keep it very simple - a short sentence. We need to establish a regime of safety. Engaging may be traumatic. learn the most from this, he/ she needs to be friends with it. When the situation is safe and befriended, it takes the lid off the learning. Prioritize. Sort for top lessons. Belief changes. Renovate’ is about improving changes that are being made. Test is the process of putting this into an ‘imaginary real’ scenario to see what happens. Time for judgement, perhaps even moral judgement. A simple YES/NO answer is all that is required here. more compelling and certain it becomes. ‘Live’ is about moving the process into the ‘real world’. Encourage, support, listen, comfort, - and coach! GO ROUND THE RING AGAIN (quickly this time, in just 5-10 minutes) to check it is ok.
"I had never actually met anyone that practiced the technique that Andrew used. My perceived idea of a life coach was someone who tells you what to do and how to best manage your time. I found out to my advantage that Andrew is not at all like this. Andrew didn't attempt to tell me how to manage my time. He restored and enhanced the self-belief that I needed. My life was resurrected, my negativity and bad thoughts were eradicated. I now feel like a completely new person - and no longer doubt myself." Bundle and Save 10% NOW! 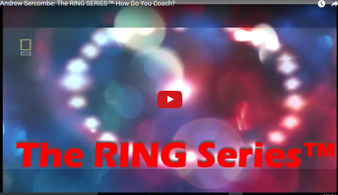 13 Videos & "The Ring Worksheets"